This particular article is written in honor of Jackie Wyatt, who has served on the mission field with her husband George for 30 years this October 2010. With the help of Kristin Hammett, another missionary’s wife, I would like to share with you what a valuable asset Jackie is to me and to others, as well as a little of what she has taught us from her many years of experience. It is essential to know that a lady is called a missionary’s wife only because of WHO she married. A wife’s main focus, after the Lord, should be her husband and then her family. As we all know, men are very different from each other, and a wife is commanded to be under obedience to her own husband. Jackie is a wonderful example of what it means to serve a husband, as he leads. We have been blessed to be guests in the Wyatt’s home and have seen their conversation of life. Both George and Jackie Wyatt, upon rising from sleep, will read their Bibles, with of course, a cup of coffee or tea to make the time even more enjoyable. Before they start their day, they want to be renewed in their minds by their Saviour. Jackie mentions, on many occasions, what life was like when they first arrived in South Africa. She often refers to the different mentors God put in her life and to the things she learned from those other women. First of all, how could any woman ever forget the virtuous qualities learned from Mom. (Jackie mentions her mother often!) Next in line would be her Pastor’s wife, which for Jackie- at that time- was Mrs. Audrey Silcox, who made Jackie feel like one of her own daughters, as she grew up in Bible Baptist Church. Jackie also speaks of how she loved her time together with other missionary families here in South Africa every Monday, as they met for fellowship and to let their children play together; or when the men would watch the children so she and Mrs. Isabel could go and enjoy time together over a cup of coffee. Holding up her skillet, Mrs. Dearmore said to Jackie, “This is your ministry.”How true that statement is, as cooking and baking seem to be a frequent event in all of our homes. Cooking for a family of five in your own kitchen is very different than cooking for a number of people in a village with no or limited electricity and water. Everything you may need must be brought with you. Preparing ahead of time is the best, and there have been many times when talking with Jackie that she has been doing baking, baking, and more baking for a particular occasion. She will then freeze it all and be ready to take it with her the day of the event. We were with the Wyatts for a special occasion in a village where she had fixed enough for a certain number, but I believe double of that amount showed up, and the Lord blessed it, and no one went away hungry. After returning home, there would be the plastic plates and cups to wash, dry and put away. Kristin Hammett shares how, when they first arrived in South Africa, they stayed a month at the Wyatt’s house. Kristin says, “My first trip to the grocery store with Jackie was crucial! It saved me from learning a lot the hard way! Sometimes I have to be careful what I fix for them when they come to my house, because several of my recipes are Jackie’s.” How true these statements are, especially the aspect of shopping. I remember one missionary from a European country sharing about her first trips to the grocery store, when she had no idea what was in the cans she was buying, since she could not read the labels. At the least, we only had to learn that Baking Soda is Bicarbonate Soda; Powder Sugar is Powder Icing; Ketchup is Tomato Sauce, and what brands are good to buy. Even though there are more imports, now, they are a lot more expensive to buy than the South African brands. There will never be a time when I am in Kruger National Park when I don’t think of Jackie Wyatt. The first time we visited Kruger was in 2004, when we were here surveying the country. We spent almost two full days in the park looking for animals in the wild with the Wyatts, Ethan Custer and a young African man. Of course, food and lodging had all been planned ahead of time, and this was done by Jackie. The preparation done in advance for this trip was obvious; there is no way to make a quick run to the grocery store to buy something for dinner. What a treat it was to be sitting outside under the Southern Hemisphere stars, having a braai (cookout), enjoying a wonderful meal prepared by hands that loved to entertain and serve others. One of their family traditions is getting up EARLY and looking for animals by 0500, so this means breakfast comes later; eggs, bacon, bread, and more cooked over a fire about 10 o’clock in the morning is a real treat. Just be careful the baboons don’t come up and steal the loaf of bread! Kristin shares how Jackie has been her South African mom. “She has been there to offer advice, encouragement, rebuke, and a shoulder to cry on when I had a miscarriage. They live four hours way. We called the day I miscarried, and they were there 4.5 hours later. They left immediately, which meantmore than words could ever say.” What a blessing to know we have a resource when it comes to child training and home schooling, and balancing these things with the activities of the ministry. Both George and Jackie have said, many times, how much they learned from Bible Baptist Church’s Family Camps, when Pastor and Mrs. Olen Adams would speak on the family. Now, on the other side of parenting, the Wyatt’s are willingly “Oupa and Ouma” (Grandpa and Grandma) or Uncle and Aunt to the next generation of missionary children, who are far from their own relatives. The ups and downs of ministry are probably the hardest thing for anyone who desires to share the gospel with individuals. The Wyatts long for others to have the joy of the Lord on a daily basis, to serve Him faithfully, and to reach others for Him. They have shared the ‘success’ stories and the disappointments they have experienced over the years, each a learning process and a time to draw closer to their Lord. As a missionary wife, Jackie has had to put her own sorrow aside in order to make sure she was an encourager to her husband. 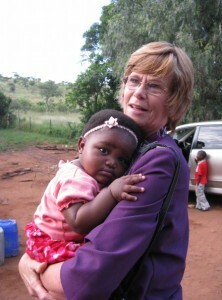 Recently, Jackie said to me on the phone, “No two days are the same in the life of a missionary.” How true this is. Words of caution, things to beware of, cultural differences, traditions, various responses between white South Africans and black South Africans, are just more ways that the Wyatts have helped us “adjust” to our new home. They arrived here 30 years ago under a very different form of government and have been here through many changes AND have faithfully served the Lord through it all. “I guess to sum it up, Jackie has had a servant’s heart that hasn’t stopped with the African people they are called by God to minister to. They offer themselves to minister to the other missionaries here as well. Her influence, contentment, and joy have greatly impacted my life,” says Kristin Hammett. Isn’t this the desire all of us should have, to be a godly influence in the lives of others and to impact them for the Lord, while having the joy of the Lord ourselves? As Alayna says, “You are the best Ouma in all the world!” We love you Jackie!